Panel 2: “Salutations, young man! I’m Dr. Bailey, Dr. Gerry Bailey. I think you and I will be great friends,” the doctor said. A close up on the doctor, for a better view of his hat and pasty skinned-face and the pink flower in his lapel. 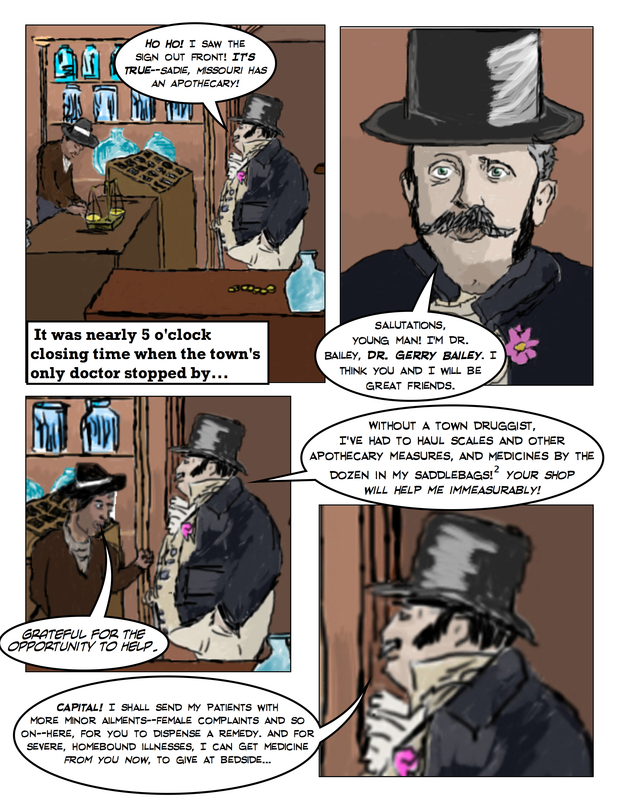 Panel 3: “Without a town druggist, I’ve had to haul scales and other apothecary measures, and Medicines by the dozen in my saddlebags!² Your shop will help me immeasurably!” the doctor said. Saul came out in front of the counter to greet Dr. Bailey. “Grateful for the opportunity to help” Saul says. The large doctor dwarfs the average-sized Saul. Paper 4: “Capital! I shall send my patients with more minor ailments—female complaints and so on—here, for you to dispense a remedy. And for severe, homebound illnesses, I can Get medicine from you now, to give at bedside…” said the doctor, his black top hat shiny. Dr. Bailey intends to buy medicines in bulk, to dispense to his patients himself. 2. “There were few prepared medicines, so doctors typically purchased chemicals in bulk, and compounded and dispensed them as required for individual use. Doctors making house calls in remote areas usually carried folding scales and druggist’s equipment so that they could measure out the required medications before they left the patient.” Agnew, Jeremy. Medicine in the Old West: A History, 1850-1900. Jefferson, NC: McFarland & Company, Inc, 2010.